Dog bandages don't stay on as easily as a person's bandage because a dog's fur and body shape makes it difficult to get a bandage to stay. Also, dogs aren't good at keeping bandages clean, which means putting the bandage on in such a way so it can be changed easily. This poses a dilemma: How best to cover a wound so it will heal without falling off or being chewed. When a dog has any type of wound, whether it's a small cut to stitches or a sore from a lick granuloma, it's essential to keep the area clean and protected from licking. This may mean a bandage, a protective covering (such as a T-shirt on a trunk wound) or using an Elizabethan collar to prevent licking. In some cases, a bandage is the best option because of the support it offers. In other cases, it's advisable to leave the area open to the air to help it heal but prevent the pet licking. Your vet will advise which is best for your dog's problem. These items are readily available from your vet clinic, pet supply store, pharmacist or online. A key factor to dog bandage stability is the correct tension on the dressing. This is an art as well as a science. If you apply the bandage too loose, it will slip off. If it's too tight, the circulation to the area is impaired. You should be able to slip a finger between the finished dressing and your dog's body and feel the finger is being gripped by the dressing. Experienced vet techs (the experts on dressings) achieve this using a combination of several layers of firmly applied cotton wadding topped by layers of gauze with moderate tension applied. Finish with a covering layer of Vet Wrap. Vet Wrap requires special handling. Its elasticity makes it self-tighten once applied. To avoid this, unwind a long enough length to pass around the area to be bandaged. Then wind this around the area with the bandage in a 'neutral,' unstretched state. Also, be aware the Vet Wrap can shrink when wet so an already snug bandage can become too tight if it then gets wet. Hence, avoid wrapping the Vet Wrap too tightly and cover any areas that are liable to get wet with a plastic bag. If you are uncertain, it is far better to remove the bandage and start again, than risk impaired circulation and gangrene. 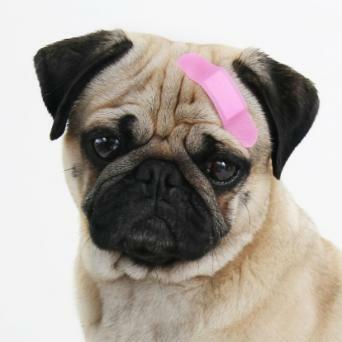 When bandaging your dog's wound, thoroughly clean the affected area. 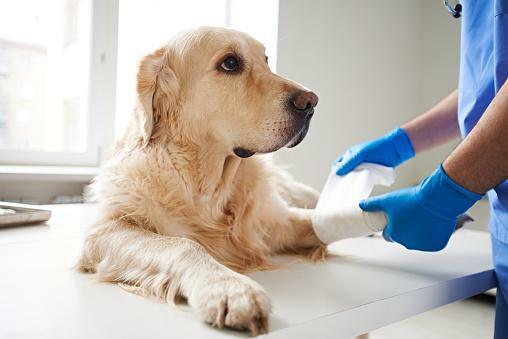 Apply any disinfecting medication recommended by your veterinarian. Place the absorbent non-stick pad over the area. Wind a layer of cotton wadding around the affected area in a few layers (two or three are sufficient for wound, multiple layers for a support dressing), making sure that it is firmly applied. Follow the same procedure with layers of gauze bandage, making sure that it isn't too loose or tight. Then finish with a layer of Vet Wrap. Make sure the injured area is dry before applying bandage materials. Keep your dog indoors most of the time when wearing a bandage. Take your pet out to use the bathroom on a leash rather than allowing him to run out in the yard unsupervised. Take care to keep the bandage dry by covering it with a plastic bag of some type when it is necessary to take your dog outside. 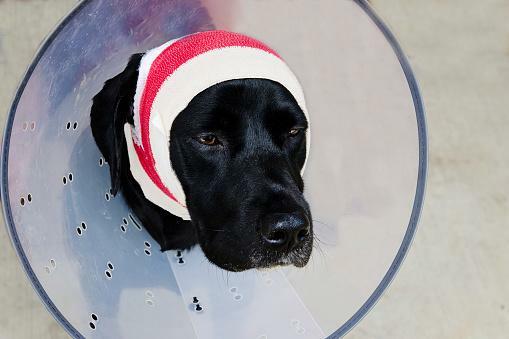 Consider putting an Elizabethan collar on your dog if he chews off the bandages as quickly as you apply them. Consult your veterinarian before making the decision to take this step. Keeping bandages on your pet is no easy task, but it's well worth the effort to make sure he heals properly. In addition, vets and vet techs use special techniques. Bandages on limbs or paws are particularly prone to slipping off, so it's important to learn how to wrap a dog's leg, The use of stirrups reduces the risk. 'Stirrups' are lengths of adhesive tape applied directly the paw with part of the strip protrudes from the dressing. During the final layers of bandaging, the protruding end is turned back on itself to be caught in the dressing itself. The last winds of Vet Wrap are applied, over the top to anchor everything together. To create stirrups cut two, six to ten-inch lengths of adhesive tape. Approximately half that length it stuck to the paw, with the other 3 -5-inches dangling off the end of the paw. One strip is applied along the dorsal (top surface) of the paw with the second on the ventral (bottom side) of the paw. Be aware that repeated use of adhesive stirrups can cause skin sores. This can be reduced by applying in a slightly different place at each dressing change. Garters of adhesive tape may be used on limbs or the tail, to provide an anchor point for a dressing. The idea is to apply a layer of adhesive tape circumferentially around the limb directly onto the fur. To decide on the garter placement, first plan where the dressing will end on the limb. Then wind a length of Elastoplast around the limb so that one or two-inches would be exposed once the dressing is in place. Then follow earlier instructions to apply the bandage. The final step is then to wind a finishing round of adhesive bandage around the dressing so that it overlaps the garter. Thus, the top tape is half on the dressing and half on the garter. The advantage of this method is the adhesive tape stop the bandage slipping down. Also, at each bandage change the sticky tape on the leg remains in place, thus the dog does not have the canine equivalent of a leg-wax by constantly removing sticky tape from fur. Depending on the part of the dog's body you need to bandage, it can be challenging to find a way to keep the bandage stable. Vets and vet techs learn specific techniques to work on these areas that you can follow. Before using any of these techniques, consider using a muzzle for your dog if you feel he will not tolerate the procedure well and to keep everyone safe. You can also pair the procedure with the delivery of treats to reinforce your dog for keeping calm. 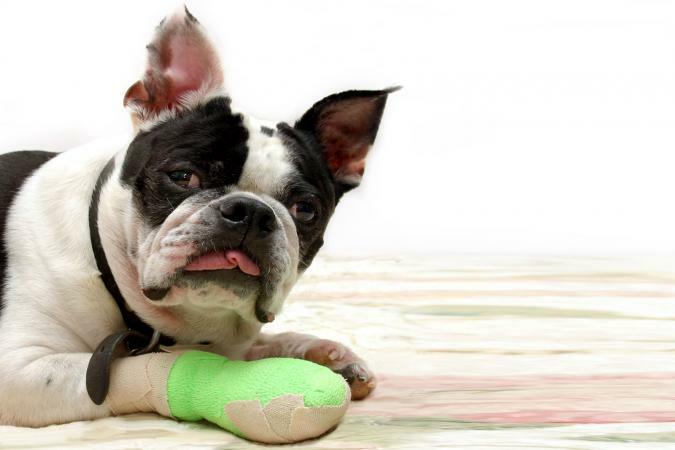 If a dog damages or tears a toenail, bandaging can keep the area safe from further harm. You can make a dog paw bandage protector for the area with a combination of gauze pads and Vet Wrap. You will use cotton padding to protect the dog's toes with a layer wrapped around the paw and the wound dressing. Follow up with a layer of Lastotel padding and a covering layer of Vet Wrap. If a dog has an injury to its paw such as a sprain or an open wound, you can learn how to wrap your dog's paw with gauze and Vet Wrap to keep him stable until you get to the vet. The easiest way to wrap a dog's torso with a bandage is to have the dog standing up with another person helping to gently restrain him. All too often the dog plays a role in pulling off a perfectly comfortable dressing. Clever use of appropriate products can reduce this frustrating complication. Neck Braces - An inflatable neck brace prevents a dog getting access to their chest, body, or upper limb, but isn't so useful to protect a paw. Protective Boots - These are protective boots or garments, such as Medipaw or Surgi-Sox, which slide over the top of a bandage to protect it from chewing. These are available for limbs and also as body wraps to protect the chest or belly area. Vet Wrap - Vet Wrap comes in many colors and is an extremely useful part of any first aid kit for dogs and even humans. The self-adhesive dog bandages are available at PetSmart and other pet supply stores. A poorly applied bandage will slip even if you use Surgi-Sox. Likewise, the perfect bandage won't stand up to a sustained chew attack. The answer is to combine as many strategies as possible to get the bandage-gods to smile kindly upon you. A combination of good materials, excellent technique, and making it hard for the dog to undo your handiwork will get you set for bandaging success.